हमले की त्रिज्या: >1,852 किलोमीटर (>1,000 नॉटिकल मील) on penetration mission with two CFTs (2,300 L), three tanks (5,700 L), two SCALP-EG and two MICA AAMs. ↑ "Egypt receives third batch of Rafale fighter jets from France". ahram.org.eg (अंग्रेज़ी में). 5 April 2017. ↑ "Press Conference – July, 21st 2016 : Éric TRAPPIER, Chairman & CEO" (PDF). 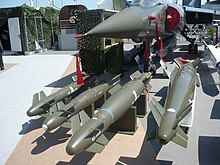 Dassault-aviation.com. अभिगमन तिथि 2016-07-31. ↑ अ आ इ ई "Projet de loi de finances pour 2014 : Défense : équipement des forces et excellence technologique des industries de défense" (फ़्रेंच में). Senate of France. 21 November 2013. अभिगमन तिथि 2 July 2014. Avant prise en compte du projet de LPM, le coût total du programme pour l'Etat était de 45,9 Mds €2013. Le coût unitaire (hors coût de développement) de 74 M€2013 pour le Rafale B (pour 110 avions) de 68,8 M€2013 pour le Rafale C (pour 118 avions) et de 79 M€2011 pour le Rafale M (pour 58 avions)." Translated: Before taking into account the draft Trademark Law, the total cost of the program for the state was 45.9 billion € 2013. 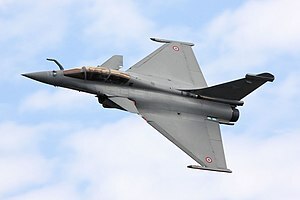 Unit cost (excluding development costs) of €74M 2013 for the Rafale B (110 aircraft) €68.8M 2013 for the Rafale C (for 118 aircraft) and 79 M € 2011 for the Rafale M (58 aircraft). "rafale". WordReference. अभिगमन तिथि 26 November 2015. "gust of wind". WordReference. अभिगमन तिथि 26 November 2015. 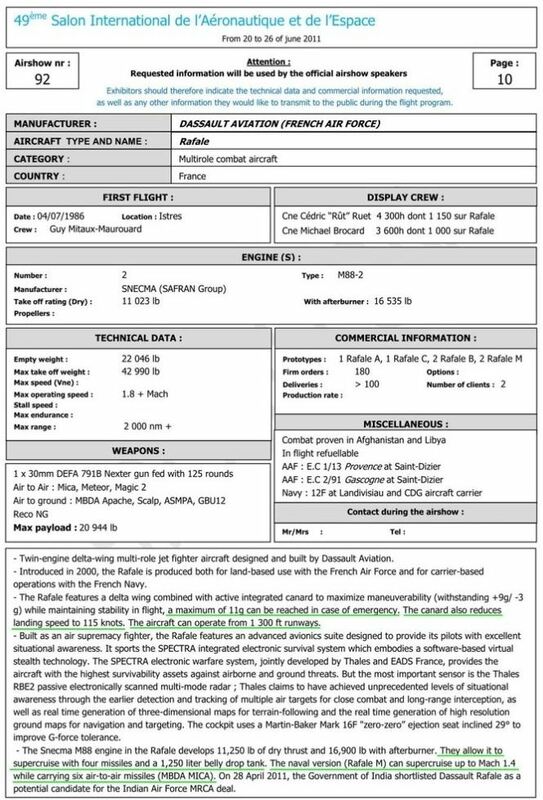 ↑ "RAFALE "F3 R" standard launched". Dassault Aviation. 10 January 2014. मूल से 13 January 2014 को पुरालेखित. अभिगमन तिथि 25 December 2015. ↑ Rahir, Patrick (2 August 2013). "France To Cut Rafale Order; Betting on Exports". Defense News. मूल से 4 August 2013 को पुरालेखित. अभिगमन तिथि 19 January 2014. ↑ "France To Make Military Personnel Cuts". Aviation Week. 2 August 2013. मूल से 19 October 2013 को पुरालेखित. अभिगमन तिथि 19 October 2013. ↑ "Rafale deployment history". Dassault Aviation. मूल से 29 September 2013 को पुरालेखित. अभिगमन तिथि 18 January 2014. ↑ "Ambala, Hasimara IAF bases being readied for Rafale jets". 1 October 2017. अभिगमन तिथि 10 December 2017. ↑ अ आ इ ई "Specifications and performance data". Dassault Aviation. मूल से 14 December 2013 को पुरालेखित. अभिगमन तिथि 18 June 2013. ↑ Williams 2002, p. 112. 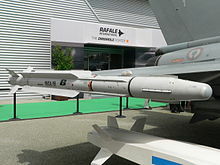 ↑ "Rafale M". French Navy (फ़्रेंच में). मूल से 20 December 2013 को पुरालेखित. अभिगमन तिथि 28 August 2013. ↑ Frawley 2002, p. 69. ↑ "M88". 28 May 2015. अभिगमन तिथि 27 April 2017. ↑ "Rafale Solo display-Display-Good weather". Rafale Solo Display. 1 January 2013. ↑ "Rafale Bourget Display 2011". 2011.